Mr. Ross also proposed an alternative for the steel industry that involved no tariffs, but would set a quota limiting steel imports from all countries to roughly two-thirds the level they were at last year. For aluminum, the Commerce Department also outlined three alternatives, including a flat 7.7 percent tariff on imports from all countries, or a targeted 23.6 percent tariff on aluminum from China, Hong Kong, Russia, Venezuela and Vietnam. A third option involved putting into effect quotas to limit aluminum imports to lower levels than were shipped to the United States last year. Mr. Ross did not indicate which way Mr. Trump might go, saying the president could pick a separate path, or reject the penalties altogether. But the president’s longstanding support for tariffs and his recent remarks suggest he is likely to support some kind of action. In a meeting with lawmakers of both parties on Tuesday, Mr. Trump played down objections to the trade measures, and said that the United States was considering tariffs, quotas or both. “You may have a higher price, but you have jobs,” Mr. Trump told the bipartisan group. Supporters of the trade action, including American steel companies and the United Steelworkers union, say American metal makers badly need the White House to step in and halt the flood of cheap imports, which has depressed the price for steel and aluminum. 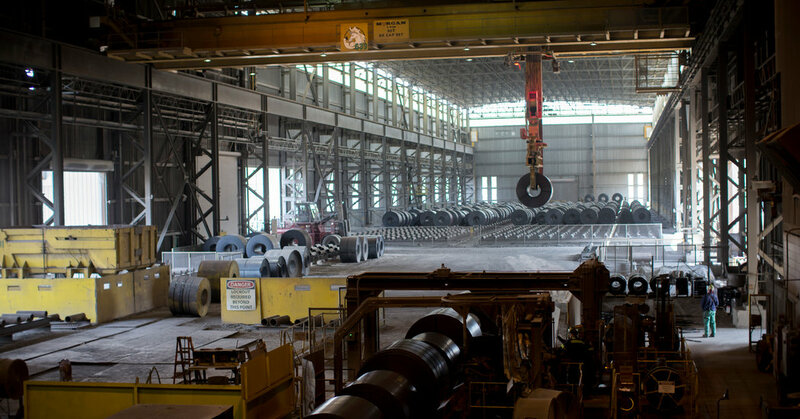 Many American steel and aluminum plants are struggling to compete in an oversaturated market and some have had to scale back production and eliminate jobs. “This is a step in the right direction, and hopefully the president responds sooner than later,” said Todd Leebow, the chief executive of Majestic Steel USA, which buys American-made steel from mills to sell to customers in construction, agriculture and other industries. Mr. Leebow said he had seen a troubling decline in the industry in recent years, and he was hopeful Mr. Trump’s measure might reverse that. But the investigation has also prompted criticism from American industries that use steel and aluminum to make their products, including automakers and food packagers. These businesses say tariffs or quotas will cause their prices to rise and shrink their profits, and could end up costing American jobs. Christine McDaniel, a senior research fellow at the Mercatus Center, a think tank that supports free markets, said that for every one steelworker that may be helped by trade restrictions, more than 38 workers in other sectors that could be harmed by it. “There is ample evidence that import taxes will harm economic growth and cost American jobs,” she said. In a call with reporters on Friday, Mr. Ross played down any negative impact from the trade actions, saying that any increase in the cost of steel and aluminum for products like soft drinks and canned soup would be “trivial.” “We really don’t buy that argument,” Mr. Ross said. Shares of American steel companies, including United States Steel, Nucor and AK Steel, rose following the release of the report. Stocks of Ford Motor Company and General Motors, which purchase aluminum and steel for their cars, declined. Steel wire to be used in the manufacturing of tires at the Zhong Tian Steel Group Corporation in Changzhou, Jiangsu. China produces roughly half of the world’s steel and aluminum. United Steelworkers, which strongly supported the tariffs, commended Mr. Ross’s announcement. “These recommendations have the potential to focus on the bad actors in the world that historically and systemically cheat in international trade,” said Leo W. Gerard, the president of United Steelworkers International. Companies with operations outside of the United States were more circumspect. Aluminum companies including Alcoa, Rio Tinto Aluminum and Constellium issued statements urging the administration to exempt Canada, a major supplier of aluminum, from the rule, and focus on the issue of Chinese overcapacity instead. Mr. Trump will have authority to determine which countries should be subject to any trade action, in part because of way in which the investigation was started. In April, the administration opened an investigation into steel and aluminum imports with a little-used provision of trade law that gives the president broad discretion to act to protect national security. Drastically remaking American trade has been one of Mr. Trump’s defining political promises. But his first year in office delivered a mixed record on trade. He withdrew the United States from the Trans-Pacific Partnership, an Obama-era trade deal, and began renegotiating trade pacts with South Korea, Canada and Mexico. Those talks now look likely to take longer than he anticipated. The administration is also weighing a series of trade cases this year that would protect American industries against imports. In January, the Trump administration decided to impose tariffs on washing machines and solar cells and modules to help domestic industries. It has also started an investigation into claims that China infringed on American intellectual property, which could result in investment restrictions or further tariffs. The Trump administration has said that its steel and aluminum investigation would help address a global issue created by China, which has used generous state subsidies to dominate the global metals trade. China now produces roughly half of the world’s steel and aluminum, after making little two decades ago. That surge in production has helped push down global metal prices to a point where American companies say they can no longer compete. But American options for aiming at China directly are limited. Because the United States has already imposed a raft of restrictions on Chinese steel in previous years, only 2 percent of American steel imports came directly from China in 2015. That means that any measures from the Trump administration are likely to weigh more heavily on other countries, including some close allies. In 2016, Canada accounted for the largest proportion of United States steel imports, about 17 percent, followed by Brazil, South Korea, Mexico, Turkey and Japan. Allies including the European Union, South Korea and Japan have also pushed back against the United States curbing imports, saying their products support the American military by providing a secure supply of metals, rather than harming it. If a Law Bars Asking Your Past Salary, Does It Help or Hurt? March 31, 2019 Comments Off on Countries Want to Ban ‘Weaponized’ Social Media. What Would That Look Like?